Keeping up with technology is either a whole lot of fun or very intimidating. There just doesn’t seem to be much middle ground. Either you’re wired that way or you’re not. Woodworkers come in both flavors — some are leading the high-tech charge and others avoid computers like the plague. Unfortunately for the latter group, production work during the next few decades is going to be more and more centered on programming. Even one-off custom work is being deeply affected by technology as drawing programs like Sketch-Up (sketchup.google.com) become even easier to use and generate more support in the form of how-to videos on YouTube. 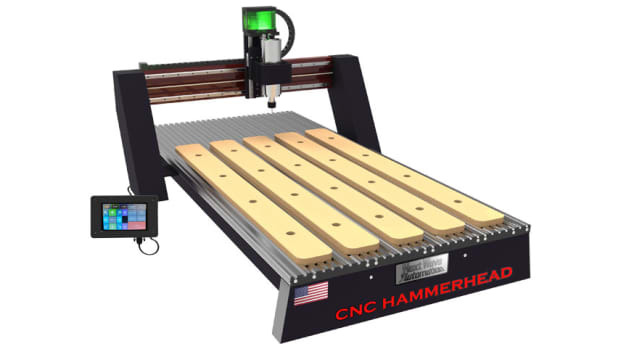 The intersection of computers and cutters in the woodshop has traditionally been CNC routing. That area has seen some major advances in recent years. Companies like Legacy Woodworking Machinery in Springville, Utah, are making it difficult for us dinosaurs to remain in denial. It offers several low-priced, yet high-quality, machines such as the cryptically-named Mini-Arty Personal CNC that reduces technology to the level that even the grumpiest old woodworker can handle with ease (yup, I’m one of them). That particular machine starts at under $7,000, which is a pretty affordable way to enter the market. It also offers a lease option, which is increasingly more common among manufacturers of smaller CNC equipment. The Mini-Arty comes with lots of support, including an ArtCAM training DVD (4-1/2 hours), online CNC training classes and weekly online CNC training webinars, and a project library that includes drawing, CAD/CAM and read-to-run G Code Files. (According to Wikipedia, “G-code is a language in which people tell computerized machine tools what to make and how to make it”.) Couldn’t be simpler, right? If the tech talk here is already wearing you down, be assured that there really isn’t very much to it. Once you learn the basics, the rest just seems to fall into place. One nice thing is that there are lots of forums, discussion boards and blogs online, so if you don’t understand something, just Google it and you’ll soon run across a computer engineer who can actually speak a little English or at least somebody who can translate their strangely exclusive language. 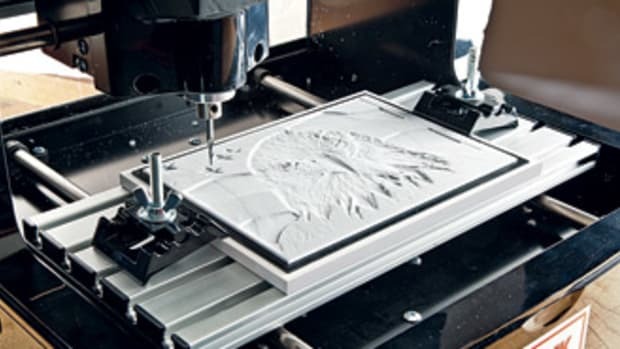 The bottom line here is that new science is now making it even easier for woodworkers to tweak their CNC operations and deliver more precise results. Taking that a little further, it looks like we’ll soon be making increasingly more complex parts cheaper, while using more computers and fewer man hours or traditional woodshop practices. If your shop is thinking of investing in CNC, here’s something to keep in mind: these machines don’t just work in wood. 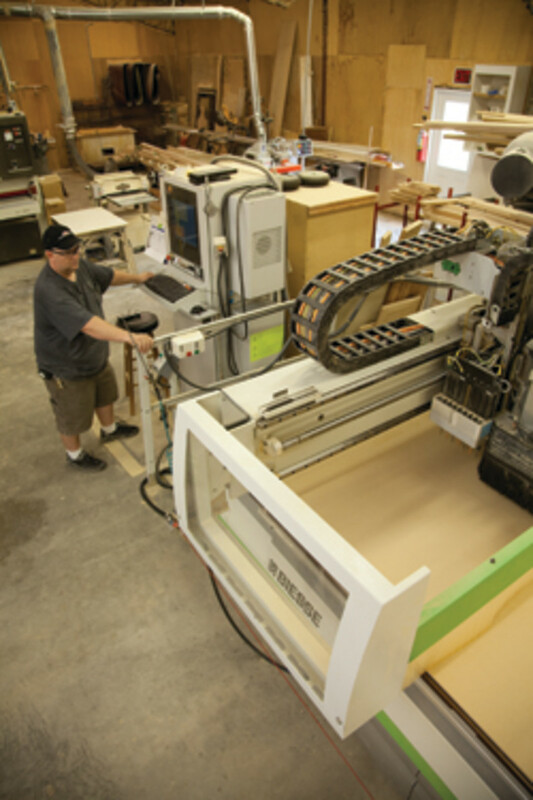 For example, Newsham’s Woodshop in Aldan, Pa., has been providing custom CNC work for more than a quarter of a century. It will quote work in solid wood, plywood and MDF, but also in high-density urethane, plastics such as Lexon and acrylic, high-density foam, Styrofoam, sign foam and even composites such as phenolic. 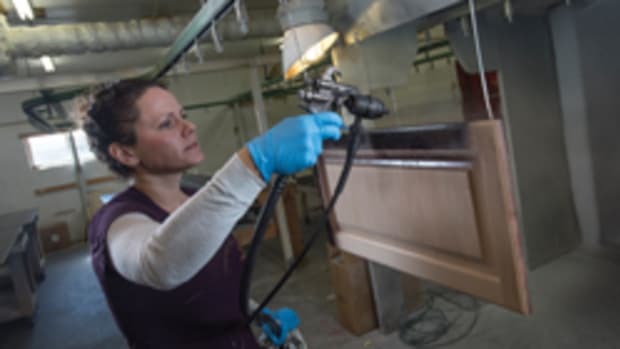 That versatility suggests that a woodshop might be able to hook up with a sign maker or plastic components shop and keep the new machine busy enough to pay the lease or loan payments. One can also build a CNC and there are both plans and kits available. This is a good route for a tinkerer who has plenty of downtime or a one-man shop that has a specific client in mind that needs lots of the same part made. For shops that have to get kitchens out the door to meet payroll, it’s maybe not such a great idea. Traditional woodworkers who are thinking of entering the CNC world also have another option. There are lots of shops around the country where a woodworker can rent time on the machines and several of these have CNC equipment. For example, in Portland, Ore., there is a 12,000-sq.-ft. facility on Southeast 11th St. called ADX (www.adxportland.com), where a woodworker can buy a membership. 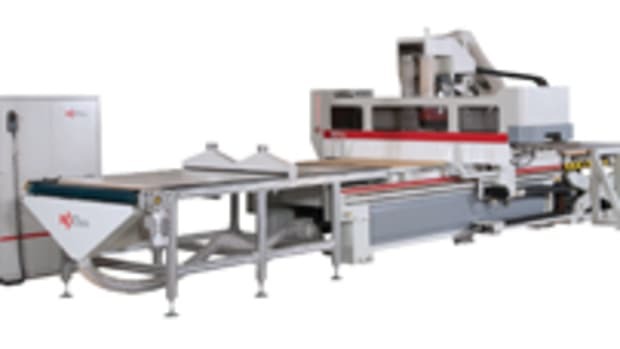 ADX has a KOMO 2.5D CNC router (www.komo.com) that handles projects up to 48” x 96”. One might learn how to run it or even hire the shop for a while to make some parts. 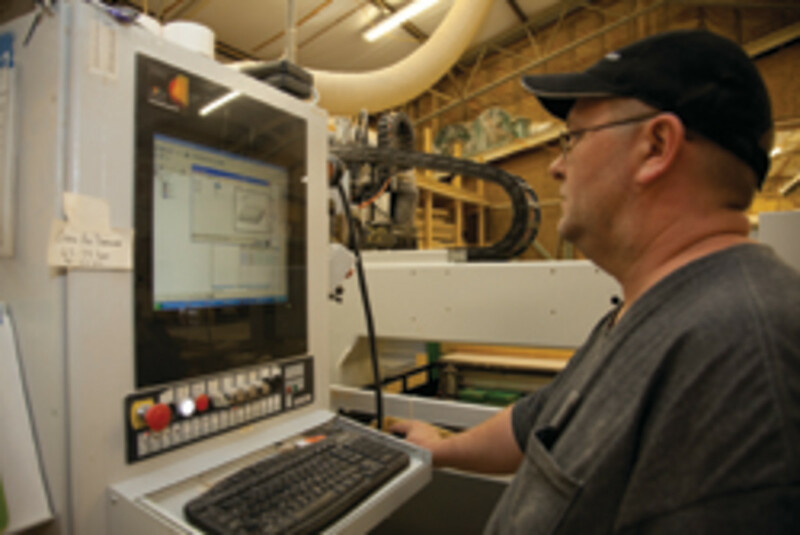 One of the biggest benefits of introducing CNC technology in the small woodshop is repeatability. The shop can make the exact same part over and over again, with exactly the same dimensions, and this opens up a lot of marketing channels. 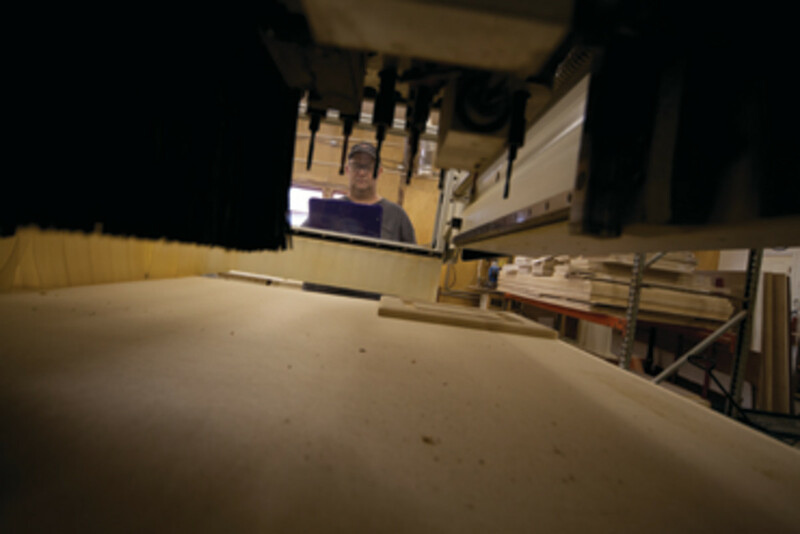 Secondary manufacturers who consider hiring a woodshop to make parts are often adding other materials to those parts in their own shops later and they need the reliability of constant dimensions to be able to make those other processes happen without a hitch. 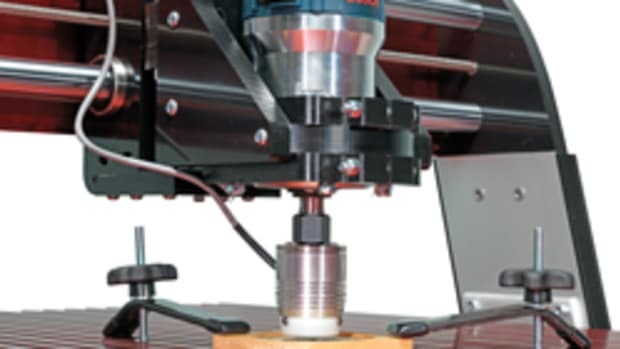 Hand-operated routers use bits, but CNC machines use heads. These can be quite complex and involve several different cutters and profiles, so there is less downtime changing over. The machine also works faster than a pair of hands (it doesn’t have to walk around the job, blow away the dust or pick up an extension cord) and the operator can often be performing another shop task while the machine makes parts, so there are several levels of time savings involved. Machines come in different configurations. For example, a five-axis machine can perform a whole lot more carving tasks than a three-axle. The latter is often an ideal choice for flat work such as signage, while the former can create true 3-D sculpture. CNCs are perfectly suited to template work. That is, an operator can create a template that allows the machine to do a certain task, then have it work on something else, and eventually come back to the original work. Having a template means that the second time around (and, of course, all subsequent times), setup is very quick. As with all technology, there is a learning curve. For example, it takes a while to figure out how fast a machine can handle certain wood species or composites, depths of cut, different cutter dimensions and so on. It also takes a little time to learn how to operate the software. But therein, too, is an opportunity. 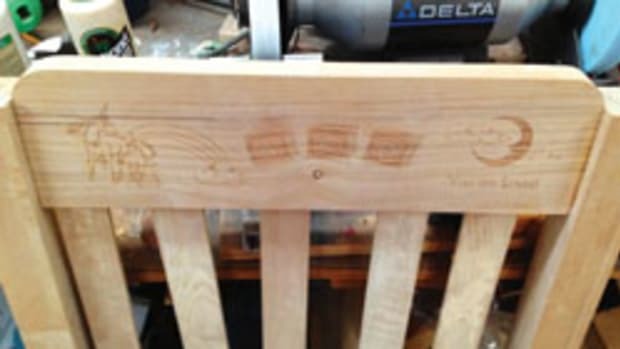 A woodshop owner can stay behind a little later in the evening when the shop is quiet (and customer and employee interruptions have ceased) to get everything set up for an employee to start routing first thing the following morning. The boss could even come in a little late and thank his new CNC machine for the time it gave him to enjoy a decent cup of coffee on the drive.